Do you like the provincial government's proposed changes to beer tents? 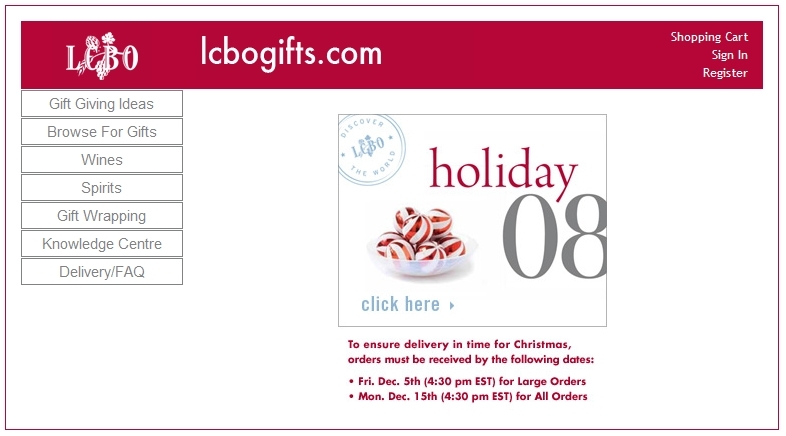 Did you know that the LCBO offers alcohol purchase and delivery online? I’m not sure if many people do, and it’s certainly not something that the LCBO makes a big deal of – there doesn’t seem to be any links to it from their main web site. 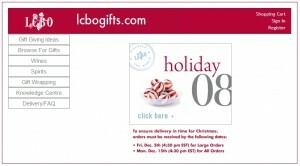 But at LCBOgifts.com, you can order select wine, spirits and beer online for delivery to your home. I’m really not sure what to make of this site. Its primary focus is encouraging gift giving, rather than simply buying booze for yourself, although non-gift set items may be purchased. It is an extremely simplistic site – basic navigation and hardly any information about the products that are being offered. From a beer standpoint, it’s pretty non-existent – 17 beer items are available for sale – a few gift packs (for example, the Historic Ales of Scotland) and some random 6-packs and singles. Any serious beer fan probably wouldn’t actually order anything from the site – the selection is much greater at any decent store location. So what’s the deal with LCBOgifts.com? It feels like something that’s all too familiar with alcohol in Ontario – I call it the “just enough” strategy. We’ve seen it before – the LCBO does “just enough” to answer a criticism and thereby not highlight the issue. Take Trappist ales for example – the LCBO could be criticized for not having many Trappists. But they do have Chimay and the odd other one through seasonal releases – thereby diffusing the issue. It is obvious that few resources are being put into LCBOgifts.com. The site experience is bland, the selection is terrible and it is not promoted anywhere. Perhaps the LCBO is testing the market to see if e-commerce is something they want to invest more in. Or perhaps its being left to die to prove that e-commerce isn’t a worthwhile for the LCBO. The advent of e-commerce has brought selection and shopping options across a wide range of industries like never before. This is unfortunately not the case with beer. It is commendable that the LCBO is making an attempt – the same cannot be said for The Beer Store which has no e-commerce whatsoever. But our beer system locks down e-commerce just like traditional retail. Unless we push for change, we won’t see any specialty beer stores online, just like we won’t see any on the street, anytime soon. That site is truly bizarre on so many levels. First, I find myself questioning the selection. To whom would I send a single can of Tiger? Or even Warsteiner for that matter? But the whole affair becomes stranger when looking at the FAQ. With the shipping costs, the only person I’d send that can of Tiger to would be someone who didn’t live within an hour’s drive of an LCBO. And you can’t send out of province, of course. I think you’re right. It’s an exercise that the LCBO can point to and say, look, we tried it, Ontario doesn’t want e-commerce. Just like Ontario doesn’t want (simple, user-friendly) private ordering. Or a raft of other modernities. But look, here’s a knit cozy with buttons, that will make your wine bottle look like a sweater. Beer delivery via internet ordering and direct or system delivery to replace the beer store. Hmmmmmm….I like it. This is what happens when you put services, that ought to be run by entreprenuers with a passion for alcohol, in the hands of government beaurocrats, assured with lifetime employment, who could care less about what their clients want. I have petitioned the lcbo countless of times to inport a larger selection of trappiste beers. Most of the time they respond within a month, saying I should make a private order for myself through them (which, believe me, costs a small fortune just for a case, because they require lab testing and all the shipping/ brokarage fees). Thumbs down to the LCBO!!!! http://www.citybooze.com does a variety of gift deliveries, across Ontario . Gift delivery orders and regular orders to Ottawa and surrounding areas Kanata, Barrhaven, Orleans, Bells Corners and Parts of Navan. If you checkout this web site you’ll find one very convenient way to get beer, liquor, and wine home delivery in Toronto area within 1 hour -anything from LCBO and Beer store.I think these guys have found a very good way to satisfy their customers with a very fast beer delivery.Thumbs UP. City wide delivery from the lcbo and beer store. Kanata to Orleans.Ottawa It is finally here. One number to order anywhere in the city. Order online or call 613 842 0555. Gift deliveries also, Kanata to Orleans hand delivered. Delivery available anywhere in Ontario. Loving the new experience to send friends and relatives gift baskets. Going to send my sister a champagne basket on her Graduating University. She will be so surprised. Lcbo delivery to your door. Fast and reliable. Order online or by phone. Which was both equally fascinating at the same time as insightful! Thanks for sharing your ideas with us. will deliver Beer store and LCBO to your door in under one hour. Avery Brewing Company ?f Boulder, Colorado ?ust celebrated th?ir 18th anniversary just a fe? weeks back. find what y?u want, where you ?ant ?t.